We are going back to INFOCon Green today. Things have stabilized and the INFOCon is used to indicate change. Awareness of Heartbleed is well saturated and Internet teams everywhere appear to be responding appropriately. Patching will continue and hopefully fill remaining gaps. Certificate Revocation Lists (CRLs) will grow, which may lead to slower load times in some cases. Please let us know if you are observing CRL issues. There is no practical way to identify if a certificate has actually been updated, unless you recorded the certificate serial number. It is common to check the creation date, BUT a CA can re-issue a new certificate and keep the original creation date. This is silly but should be noted. The client side (wget, curl, etc...) of Heartbleed is mostly a non-issue, but there are a few exceptions. Watch for VPN client updates. Certificates continue to be revoked. 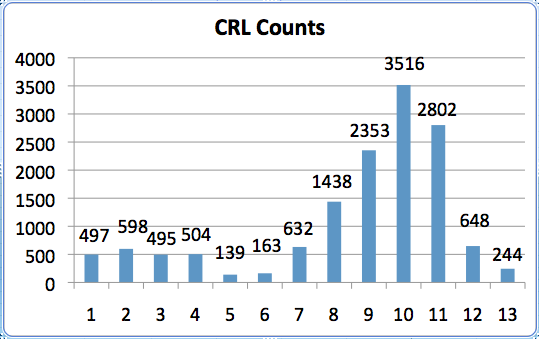 We have taken the liberty to look at the CRL counts of sixteen different CA's since April 1, 2014. In summary, please keep scanning and patching all of your servers and encourage all end users to change their passwords after a site's certificate has been updated.